The website budgeting template is an excellent tool for setting up and maintaining the costs related to a website. It allows you to enter a variety of financial information and automatically calculates revenue and expenses. It allows you to maintain website costs for a three-year period. The template calculates the benefits and costs from your website. You can download the template for free directly from this page. The template can be customized for your business and allows changes in tax rates, required rate of return and other key area of your business. The template is easy to use and can be downloaded right now from our page. Download the template – The first step to getting started and using the template is downloading the template from our page. When you click the Download link, a box will open with options. Save the template – Once the opening dialog box appears, you will have the option to save the file or open it. You will want to save the file to the default or designated location on your computer. Open the template – The next step is to navigate to the location on your computer you saved the template in the previous step. 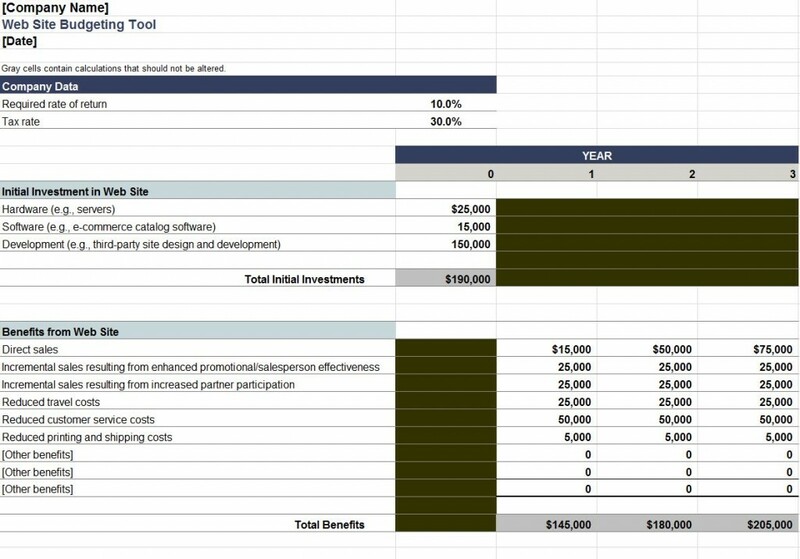 The website budgeting template should be opened using Microsoft Excel which should be the default program choice. Customize the Template – The final step is to customize the template with your personal information and your desired preferences. These options include fonts, colors, your financial information and your company information as well as the date. Before downloading the Microsoft Excel website budgeting tool, cookies should be enabled for the Internet browser you are using. Once you enter the changes and edits to include your business information, the document should be saved with a different file name of your choice. The original downloaded template should not be changed and used as a reference. When saving the template, you may also choose to save it to a flash drive, external storage, or cloud storage space. This way you can have access to it if you are on the go or not using your computer. With the status of today’s economy, consumers and businesses alike should be conscious of spending. Whether your company is small or large, budgeting is a critical part of running and maintaining a successful business. Because every company needs a website, the associated costs and expenses should be tracked. The Microsoft Excel Website Budgeting Template is the best tool to accomplish this.